dabbleboard.com Retail price: There are two types of accounts: a free account and a Pro account, which has more security, storage, and support. Pro prices range from $4 to $100 for educational and nonprofit institutions. Dabbleboard is a Web 2.0 tool that acts as an online whiteboard. It allows teachers and students to work collaboratively or individually to create pictures and graphic organizers. Quality and Effectiveness : Dabbleboard enables teachers and students to easily create many graphic organizers, which can then be used as worksheets or filled in and submitted online. The tool makes it easy to draw shapes for lessons, such as models of atoms in chemistry, and to illustrate problems in physics. Ease of Use: Drawing on Dabbleboard is fairly intuitive, but there is also a video that shows users how to take advantage of the tool’s helpful tricks, such as how to draw shapes. The video also demonstrates how to work collaboratively (by sending collaborators a link to the page or communicating via Webinar) and how to publish users’ work so others can view it. It would be helpful, however, to have more information on how to collaborate effectively. Creative Use of Technology : This product combines the best aspects of a whiteboard and a word-processing program. Furthermore, Dabbleboard creations can easily be transferred to wikis and Web pages or simply downloaded to a user’s computer. Suitability for Use in a School Environment: Because Dabbleboard is so easy to learn, neither the teacher nor the students will require much prep or class time to become familiar with it. Similarly, since it is a Web tool, no equipment is needed for storing data. Students and staff simply log on to their accounts online. 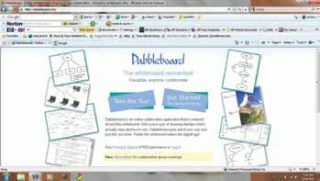 Dabbleboard is a versatile Web 2.0 tool that can be used to demonstrate many subjects and various types of content more effectively. ¦ Easy to use and great for making graphic organizers. ¦ It is an online tool, so everything is digital and requires no maintenance, downloads, or storage space. ¦ Schools can either use it free or decide how many Pro accounts they need.